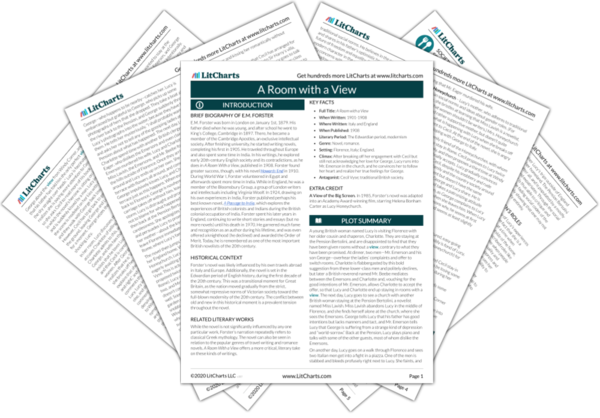 Instant downloads of all 946 LitChart PDFs (including A Room with a View). 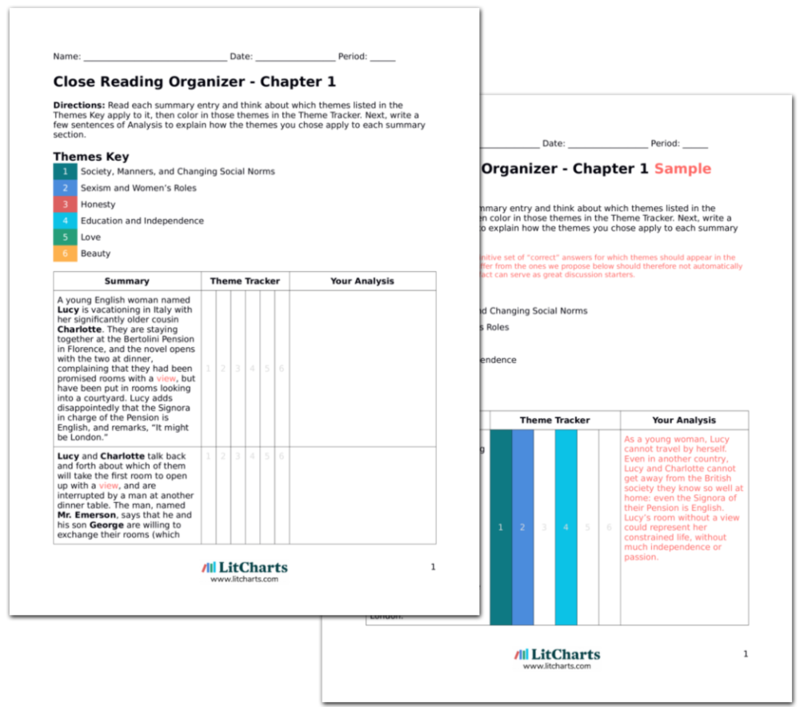 LitCharts assigns a color and icon to each theme in A Room with a View, which you can use to track the themes throughout the work. Upon returning to the Pension, Lucy is surprised when Charlotte is not troubled by Lucy’s adventure in the piazza. The next morning, Mr. Beebe invites Lucy and Charlotte to accompany the Emersons and him on a day trip. Charlotte declines, but says that Lucy might like to go. Lucy politely declines the invitation, and walks with Charlotte instead through the city. In the same piazza where Lucy had fainted the day before, Lucy and Charlotte encounter Miss Lavish, who is reading about the stabbing in a newspaper, and plans to work the story into her novel. Lucy is surprised, because Charlotte is normally overly concerned and protective of her. The murder the previous day was a violent interruption into Lucy’s protected, civilized world, but now she re-enters her privileged social life with Charlotte and Miss Lavish. Lucy follows Charlotte’s lead in declining Mr. Beebe’s offer with proper politeness. Miss Lavish describes her planned novel, about “love, murder, abduction, revenge,” and including “a deal of local colouring,” about Florence. She hints that she is also going to skewer British tourists in Italy, modeled after the Emersons. Lucy and Charlotte leave Miss Lavish and Charlotte tells Lucy that she admires Miss Lavish. Lucy and Charlotte then run into Mr. Eager, who invites them to join him on a ride into the nearby hills, to get a view of Florence. While Miss Lavish considers herself a radical in comparison to people like Miss Alan, she looks down on those of the lower classes, like the Emersons, who she denigrates as common tourists. She is a bit of a hypocrite, despising the snobbery of Miss Alan while showing plenty of her own. Charlotte is pleased to receive Mr. Eager’s invitation, because she sees him as someone who is in touch with the real Florence, beyond what mere tourists see. The narrator says that Lucy would have been equally pleased only a few days earlier, but now had different priorities. Nonetheless, she eagerly accepts the invitation, and is even more excited when she learns that Mr. Beebe will be coming along, as well. The British travelers are obsessed with finding the authentic Italy or Florence, because such a thing would offer a real alternative to or brief escape from the British society they are used to. Lucy’s new priorities are ambiguous but may suggest that she has the beginnings of romantic inclinations for George. Mr. Eager mentions that in this very piazza the day before, “the most sordid of tragedies,” occurred. Charlotte says that Lucy witnessed it, and claims responsibility for not chaperoning Lucy at the time. Mr. Eager asks Lucy if the man who died did so very near her, and Lucy thinks to herself that “respectable people” like Mr. Eager are more interested in gory details about the matter than someone like George Emerson. Charlotte sees Lucy as in need of her protection, and takes responsibility for letting her go off alone. Lucy sees that manners and respectability can often be just a façade: the supposedly more noble Mr. Eager is actually more interested than George in the salacious, gory details of the murder. An Italian vendor tries to sell Mr. Eager some photographs, but he ignores him. Lucy, Charlotte, and Mr. Eager go shopping and buy “many hideous presents and mementoes.” By the end of the morning, Lucy realizes that she has “ceased to respect” both Mr. Eager and Miss Lavish for some reason. Charlotte and Mr. Eager talk about the Emersons, and Mr. Eager says that Mr. Emerson has written for the “Socialistic Press.” Mr. Eager says that Mr. Emerson is “the son of a labourer,” and he and Charlotte both agree that there is “something not wholly vile,” in the way Mr. Emerson has climbed the social ladder. Lucy is beginning to question more significantly her elders and social superiors, losing her respect for the social norms that no longer seem to always apply in modern times. In doing so, she is asserting her own thoughts against what she has been taught. Mr. Eager and Charlotte are very patronizing in the way they refer to Mr. Emerson’s rising up the socio-economic ladder, looking down at the laboring classes. Mr. Eager mentions Mr. Emerson’s wife, who is dead, and after some hinting finally says that Mr. Emerson murdered his wife (though he supplies no proof). He asks Lucy if the Emersons had said bad things about him when they were with her in Santa Croce, and Lucy assures him they did not. Mr. Eager thinks that Lucy is defending the Emersons, but she insists she isn’t. Mr. Eager leaves. For someone supposedly concerned with manners and gentility, Mr. Eager has no qualms with slandering Mr. Emerson with an unsubstantiated rumor, and seems overly interested in gossip. Charlotte realizes that Mr. Beebe is planning to take Miss Lavish with him on the ride and worries about who will sit with whom, since Mr. Eager dislikes Miss Lavish. Meanwhile, Lucy is lost among the “questions rioting in her brain,” after experiencing such strange things in the “magic city” of Florence. As Lucy thinks over the murder she saw and the murder accusation against Mr. Emerson, Charlotte continues to figure out seating arrangements for the upcoming drive. Charlotte’s worries over the trivial matter of who will sit where in the carriage shows how silly concerns with manners and proper social behavior can be. Lucy, meanwhile, is pondering more significant things—since coming to Florence, she has already had her eyes opened to a variety of new, strange people and experiences. The narrator’s description of the statues hints at Lucy’s own transition from the “innocence of childhood” to maturity. They are also foreboding, in their suggestion of having “done or suffered something,” suggesting that Lucy’s transition towards maturity and independence may involve a loss of innocence. Fredericksen, Erik. "A Room with a View Chapter 5." LitCharts. LitCharts LLC, 18 Jun 2014. Web. 25 Apr 2019. Fredericksen, Erik. "A Room with a View Chapter 5." LitCharts LLC, June 18, 2014. 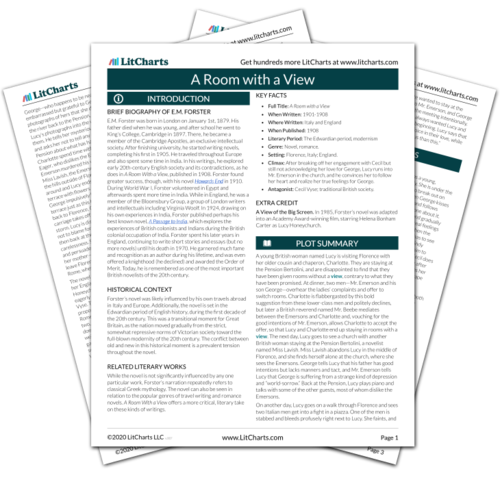 Retrieved April 25, 2019. https://www.litcharts.com/lit/a-room-with-a-view/chapter-5.